Happy weekend! Did you happen to notice how today seems a little brighter than usual? That the planet is somehow better aligned…? That would be because, after a whole week of (thinly disguised) patient waiting, I finally received the replacement part for my sewing machine! Thank the heavens. There was a LOT of cutting out this week. You’ll see the fruits soon, I hope, but for now, here’s something I finished a while ago. 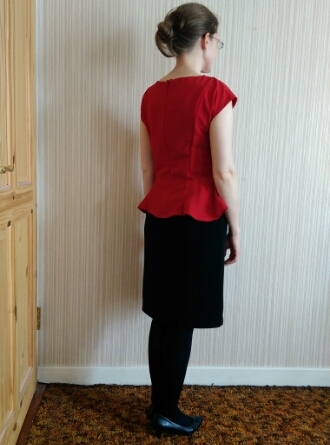 The ‘Liverpool‘ was the very first shirt pattern I used (see here!) and I have to say, for a total shirt novice, it was perfect. 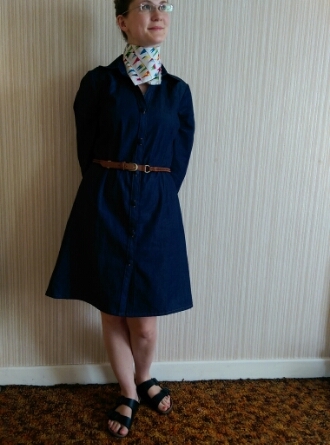 At the time I bought it, I never, ever considered that a shirtdress, which is a variation offered in the pattern, would ever be on my agenda… but here we are. For this, I used a lightweight denim found in Hickey’s. I think it was about €12/m and I needed about 2m. I made the same adjustments that I made for the other shirts – I added an inch to the centre front and I took about 2cm out of each sleeve cap. A feature of this design are the double darts on both back and front and I really like the fit it gives. That said, I think a dress this dark benefits from a belt. When this was in the planning stages, I had an idea to use a fantastic little fat quarter I picked up a while ago. I was thinking to use it for the inner collar stand to give it a bit of life. In the end, I decided not to, as it would be more versatile if it remained plain. Since I wear neck scarves a lot (usually when cycling), I decided to just hem the fat quarter and use it this way. I think the pattern is based on maritime flags. And yes, the end result is a little zany BUT it can be removed! This has been a long time in the making! 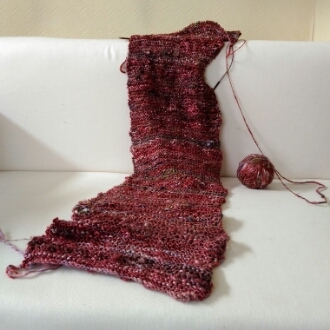 I first started it on honeymoon with a sport weight yarn, but it turned out too thick and dense, so I ripped it out. 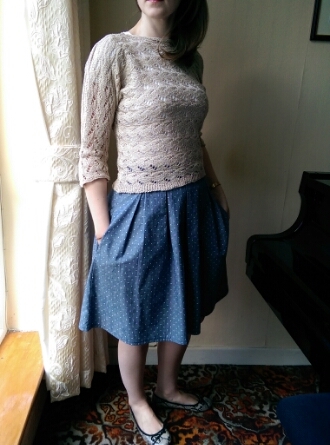 I really liked the design so last summer, I bought some Katia linen and knit it again. Although I’m really happy with it, I think that something even more lace weight would be better. Other than ordering the recommended yarn, which is a 4 ply linen and $$$ when you factor in shipping, this was the closest I could get. 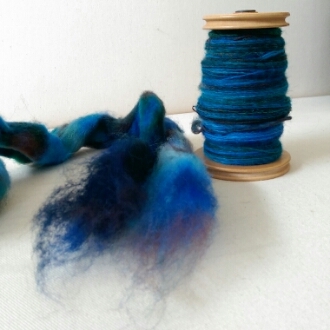 I think a lace cotton would probably work out really nicely too. 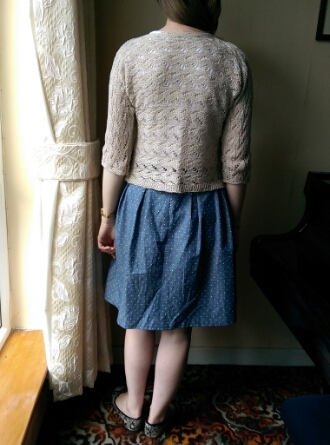 The pattern is from Quince & Co, who, by the way, have the most wonderful aesthetic. You may not like all their designs, but the way they’re portrayed really makes you WANT to like them. The front and back are knitted both the same and then you sew them together. They’re knitted side to side, which makes it tricky to judge the length. This turned out a little shorter than I prefer but looks fine with a high waisted skirt. The pattern is really well written and with a little concentration, the shaping for the neckline is no problem to follow. The rest is very straight forward. 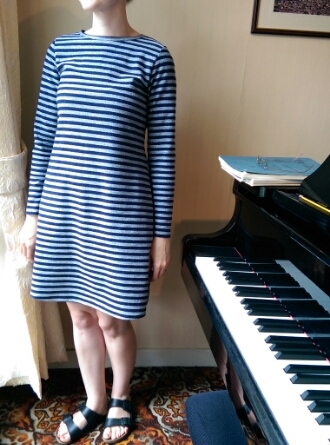 I’ve been trying to muster up the courage to wear this – I really wasn’t sure what to wear it with – but it seems grand with just a Penney’s t-shirt underneath. We’ve been having very mixed weather these days. We had big thunder and hailstones earlier this week, but today is lovely out. To put it in context for non-British Islers, lovely is 18℃ with not much of a breeze. Regardless of the sun, the air can be quite cool right into July, especially along the coast, which is the majority of Ireland. Therefore, days that can be enjoyed with neither jacket nor tights are to be treasured! Enjoy your sun – I’ll be back soon with something different! Hope you all had a lovely weekend! It did pour in Galway but I had a good time anyway. I didn’t finish any sleeves on my red cardigan, but I did get the button band done. I’m not sure how much yarn the sleeves are going to take so I figured I should do the band first since that’s more important in a way! So here’s something I finished up in March. It was an extremely busy month, musically speaking, so this was the majority of what I achieved. 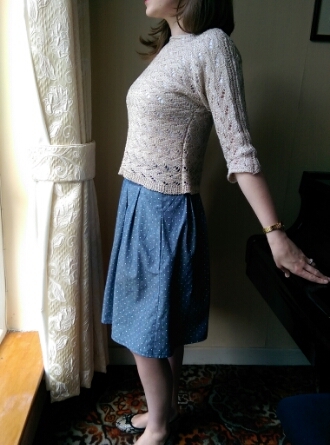 From the first time I saw it, I really loved the newest Lisette for Simplicity pattern. I think it’s number 1666. 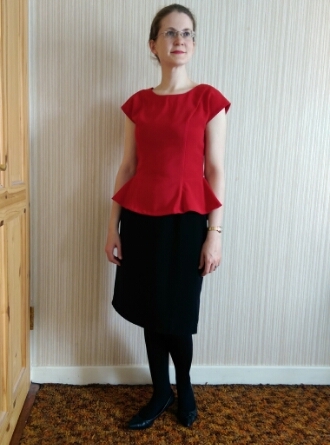 The pattern includes these two – a very simple, unlined straight skirt and peplum top, as well as a beautiful dress version of the top and a bag. The bag is like a big tote and, although super practical-looking, is not the best match for the other outfits. I’ll probably make it all the same though! I used polyester georgette from Hickey’s for the whole thing. I bought the red months apart from the black but they turned out to be exactly the same type. 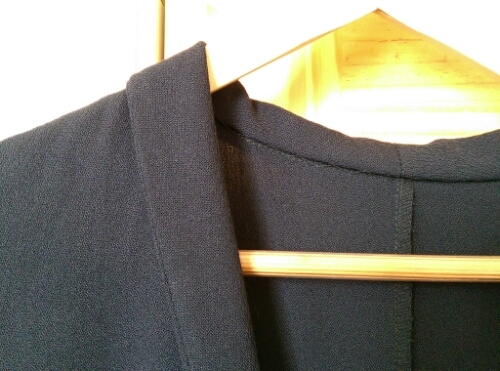 Georgette has a sort of matt, crepe feel to it, so it has a good drape but isn’t quite as posh looking as satin. 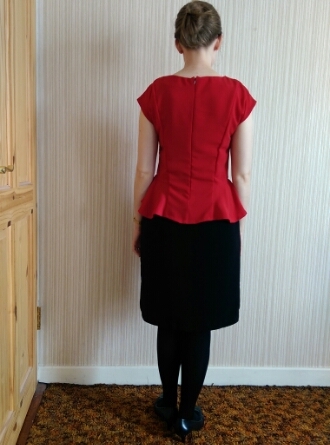 I was really unsure about the top, because I’ve never worn a peplum before and I was afraid it would make me look huge. Can you see how the centre back panel lays flat? It’s the same on the front…so the end result is a bit more streamlined than the usual circus tent. 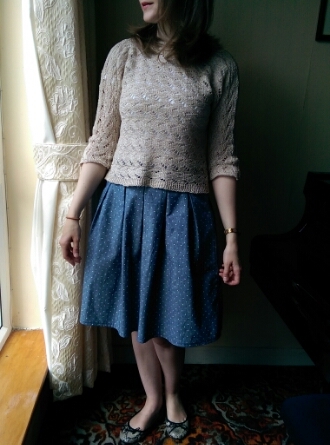 I finished the skirt first and have worn it many times. The top I haven’t worn at all but like all concerting gear, I’m always glad to have it on hand during a busy period. 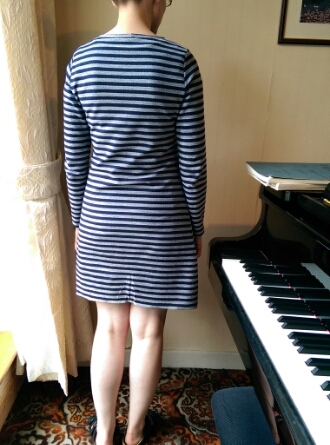 I don’t usually stand like this…but you can see how the sides flutter! 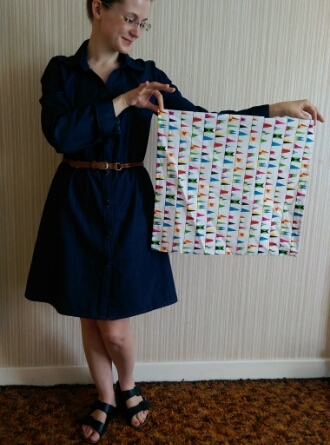 All in all, this was a very manageable pattern. I think that it really lends itself to dressing up or down. For example, you could make a totally casual outfit in a denim skirt and floral top. Or even more dressy in lace or brocade. 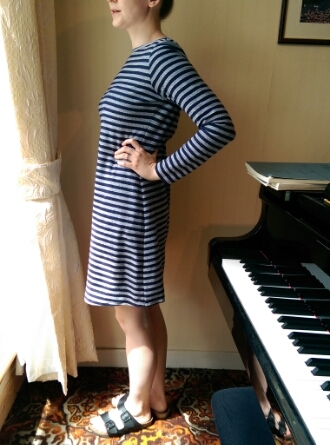 As with all of the Lisette patterns, the fit is a true petite: I cut the size for my measurements (I think it was a 10?) and needed no shortening of the torso or a different size for narrow shoulders.